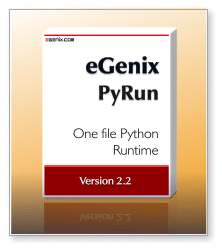 eGenix PyRun™ combines a Python interpreter with an almost complete Python standard library into a single easy-to-use executable. Including Python 3.4 and 3.5 support ! eGenix has been using eGenix PyRun as run-time for the Linux version of mxODBC Connect Server product since 2008 with great success and decided to make it available as a stand-alone open-source product. Python 2.6, 2.7, 3.4 and 3.5 Support: PyRun works with all popular Python versions. We chose the single source approach for achieving this, but had to drop Python 2.5 support as a result. You'll always get the latest version of PyRun that way. See the virtualenv replacement section below for more details. Please note that we build eGenix PyRun against OpenSSL 1.0.2 on Mac OS X. The system version of OpenSSL (if installed at all), will likely be an ancient 0.9.8 version, so you need to upgrade to a more recent version using e.g. Homebrew, MacPorts by manually installing OpenSSL to /usr/local/ssl/ and adjusting the linker paths. The script will download the right PyRun binary distribution for your platform, install it in the targetdir and then download and install setuptools and pip. If you want to build against a specific Python version, you can specify the version using the make parameter PYTHONFULLVERSION=2.7.12. Please have a look at the PyRun/Makefile for more ways of customizing the setup.